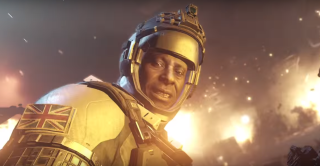 After the this weekend's Treyarch/Black Ops Infinite Warfare teaser we now have full trailer reveal confirming space-based combat for this year's COD. It looks like this has been forced by an earlier leaked cut of the trailer (there’s a reveal stream due later today) and appears to show a war between Earth colonies after a surprise attack on Switzerland. "Infinity Ward breaks new ground by exploring the weight of leadership and its responsibilities. In a desperate time of overwhelming adversity, the player, as Captain of their own warship, must take command against a relentless enemy. Experienced soldiers are thrust into extraordinary circumstances that will test their training and reveal their true character as they learn to lead and to make the hard decisions necessary to achieve victory. The game also introduces stunning, never before seen environments, new weaponry and inventive player abilities to Call of Duty. The entire campaign – from boots-on-ground combat to piloting high speed space-fighters – occurs as a near seamless experience with few visible loading times, and delivers the hallmark, blockbuster franchise moments that fans love." We’ve also had this teaser of sorts from Infinity Ward, the studio behind this year’s instalment, talking up the series' history and promising “a new level of storytelling”.